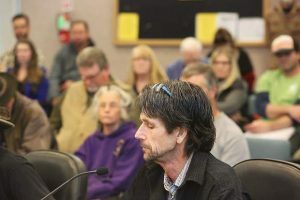 Nevada County supervisors couldn’t have mistaken the message — quickly allow local cannabis cultivators to enter the legal market or they could miss out on another year’s grow season. Diana Gamzon, executive director of the Nevada County Cannabis Alliance, two weeks ago urged supervisors to provide local authorization at their Tuesday meeting. That local authorization is essential to gaining a temporary state license before the Dec. 31 cut-off date imposed by California. Both local authorization and a state license are needed to enter the legal market. Supervisors and county staff say they want growers to have licenses for next year’s growing season. After over two years of at time contentious conversations between the two sides, the county and cannabis advocates appear to want the same thing. Problem is, local authorization wasn’t on the agenda for Tuesday’s supervisor meeting, and a permanent grow ordinance — along with an environmental review — remain several months away. “At this time the county hasn’t made a decision about what a potential local authorization would look like,” Gamzon said. Supervisor Ed Scofield, chairman of the board, said in an email that county staff is working with cannabis farmers. Sean Powers, director of the county’s Community Development Agency, said in an email that staff anticipates updated information from the state this week about what he called an evolving licensing system. Once they have that information, staff will determine what to recommend to the Board of Supervisors, if anything. “We all have the same goal of wanting permits and licenses available for the 2019 season,” Scofield said in an email. According to Gamzon, the time required to apply for and get a license, along with the county’s review under the California Environmental Quality Act, are possible barriers to getting plants in the ground by spring 2019. Gamzon said it could take up to six months for someone to obtain an annual state license, and that’s after they’ve received local authorization. There’s a $1,000 application fee for a state license. Temporary licenses are free, said Alex Traverso, the state Bureau of Cannabis Control’s chief of communications, in an email. Gamzon said it could take only four to six weeks to get a temporary license. However, the state will issue no temporary licenses after Dec. 31. And that’s why the cannabis alliance has emphasized urgency. Another reason for urgency is the recently created “provisional licenses.” Gamzon said that someone with a temporary license could become eligible for a provisional license, which the state could issue quicker than a permanent license and help local growers start cultivating next year. “This is why there is an immediate need now for a solution,” she said. Elevation 2477’, Nevada City’s medicinal cannabis dispensary, sells few items that come from Nevada County. Daniel Batchelor, the dispensary’s CEO, wants local products on his shelves. Nevada County farmers are some of the best in the state, he said. 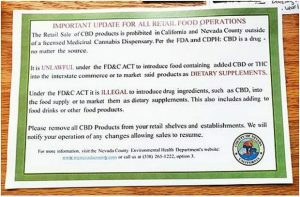 To get their products, however, the county must provide local authorization. “We really want to have local product,” Batchelor said. “There’s no need for us to outsource. I want to keep the money here. “The biggest thing is we really want to source locally,” he added. Batchelor said he must order a minimum amount of product from out-of-county to avoid a fee. “If we don’t make the minimum order, then they will change a delivery fee, which can cost up to $400,” Batchelor said. Gamzon in an email said she has no hard data, only anecdotal, about how the lack of a legal marketplace is affecting local business. She fears any further delay in the county’s permanent grow ordinance will hurt the economy. The county’s temporary medicinal commercial cannabis rules have brought eight farmers into the legal market. That’s under 1 percent of the county’s total growers, Gamzon said. “Without reasonable policy in place our local industry will be devastated,” she added. The relationship between cannabis advocates and the county has changed significantly since then. The relationship, strained for years, nearly fell apart when on Jan. 12, 2016, supervisors passed an urgency ordinance banning all outdoor grows. About two years ago advocates held a rally outside of the Eric Rood Administrative Center. They took turns speaking to a crowd as others waved signs. That scene has changed into one where alliance members and supervisors now work together. It’s not a perfect relationship, but it’s becoming stronger. Basil McMahon — with Thrive Society, a Nevada City cannabis distribution and manufacturing business opening this fall — said the county’s move to allow temporary commercial medical grows is a significant step. He said he’s grateful. Batchelor said he thinks supervisors are taking a calculated approach as they write the permanent ordinance to ensure they do things right. Gamzon said that over the past two years she’s learned that local government moves slowly. Knowing this, she wants her organization to provide supervisors information in a timely manner. Scofield called advocates like Gamzon legitimate business people who want to play by the rules. “I don’t say that lightly,” he added.